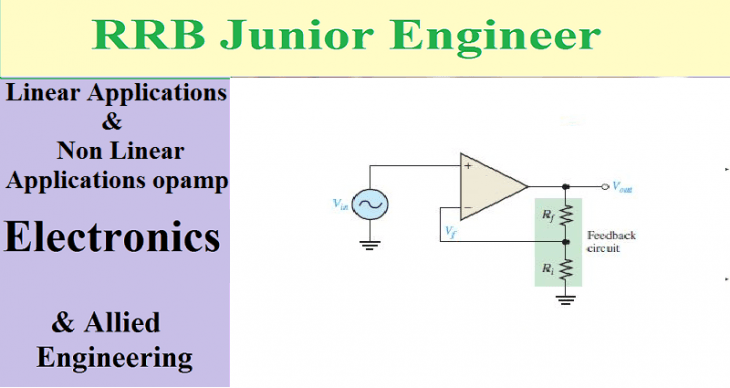 Op-Amp or operational amplifier have a lot of applications in the modern era of integrated circuits. It can be used in its amplifier mode or switching mode, When the mode of op-amp changes its performance also changes. with this mode change, reference voltage change, feed back change (positive or negative or maybe no feedback) and component change we can create numerous applications. Such as Integrator, summing , inverting amplifier, non inverting amplifier, integration and differentiation, comparator etc. Some of them are linear applications and some others are non linear applications. Here we are finding Linear and Nonlinear Applications of OP-Amp with examples. The output voltage or current which is directly proportional to either input voltage or current are called LINEAR Op-Amp Circuits. A NON LINEAR OP-Amp is one in which the output signal is not directly proportional to the input signal. In Linear applications, op-Amp works in Amplifier mode, which is a very narrow linear region of the op-amp characteristics. This narrow region is obtained by a negative feed back to the Op-amp. In Non linear applications, op-amp works in switching mode. Non-linear operation can result from using components in an op amp circuit that cause the non-linear operation. In other words non-linear operation occurs when the op amp output reaches either positive saturation or its negative saturation. Precision rectifier or super diode with the combination of op amp as voltage follower and a diode.